The two newly hatched turkey poults drying under their heat lamp. Two of Valhalla's ten incubating turkey eggs actually hatched tonight! 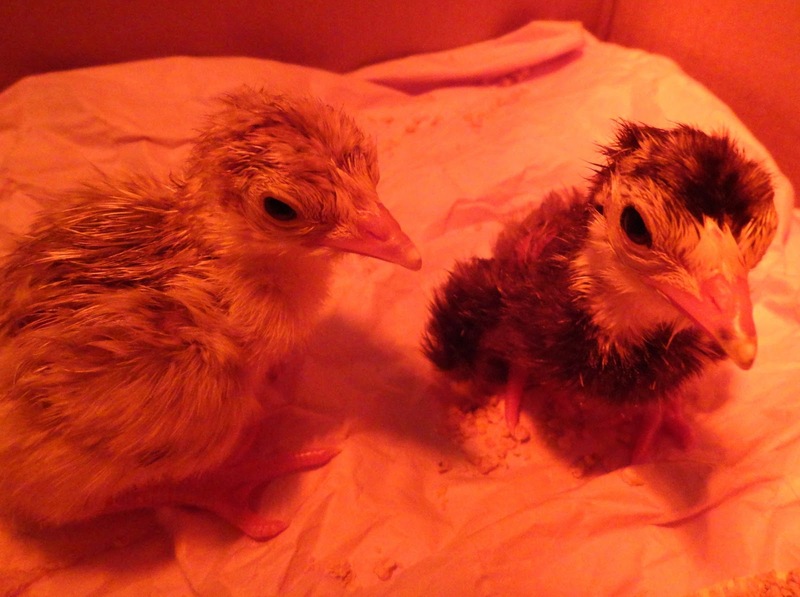 Here's a photo of the poults at about an hour old sitting under their red heat lamp, their feathers are still a little damp but boy are they loud already! any way. The incubator is still running for the eight other eggs, maybe there's nobody home but perhaps these two hatched early. 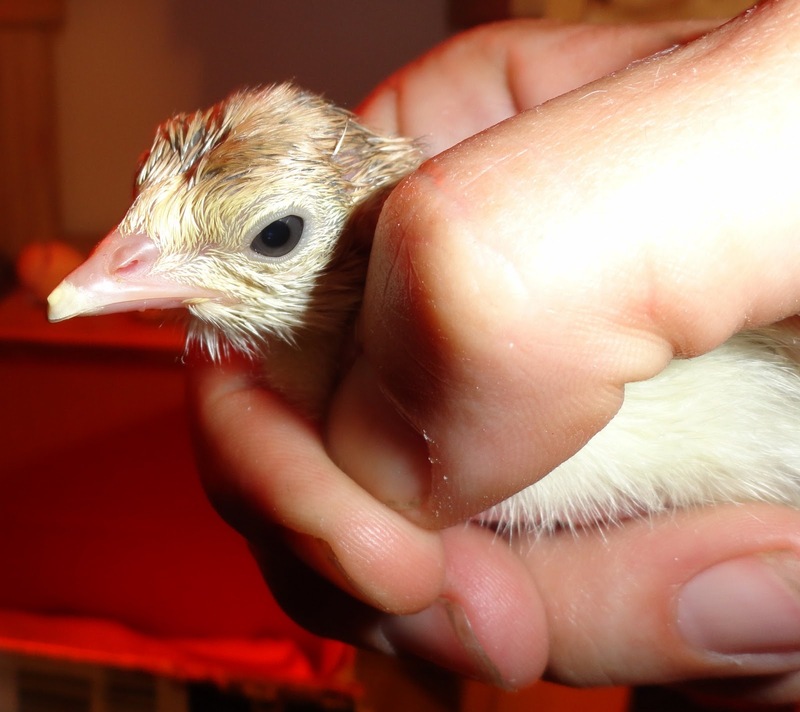 It can take hours for poults to peck their way out of their shells. eggs, at least around here. Turkey eggs are about the same size as chickens eggs in the grocery store, thus the newly hatched turkey poults are tiny. Hard to believe that such little things could systematically peck their way out of these shells from the inside like that; now outside under the heat lamp they're trying hard to learn to walk but still fall all over the place. It took a long time for her to peck her way out of her shell but now she's finally here, meet "Miss Late to Lunch" (we call her "M-L-Squared" for now)! She arrived to Valhalla today, all by herself about 18 hours after the first two turkey poults did last night, and while not as physically strong as Penguin and Sarah (who are now happily living in the main living room brooder), MLSquared is doing just dandy now. She's already learned that if she chirps really loudly then humans will race over to see what might be wrong and also check her temperature with a remote laser gun, then pick her up and dip her beak into water and food. Yes, she knows where her water and food dishes are already, but she seems to think it's a lot more fun to call on dutiful humans to service her. Well. Tomorrow when her feathers are completely dried she'll be put in the brooder with the other two, all alone or not, there's no excuse for completely spoiling this little poult! 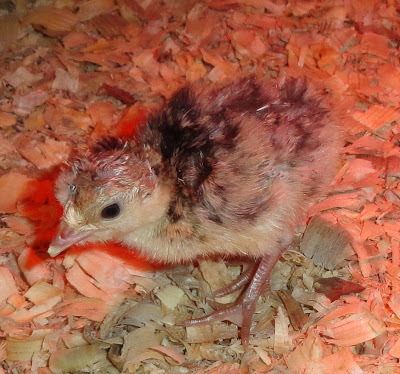 One more poult finally hatched, rounding out this mini-flock of turkey poults to a total of four... so of course we call her Ms. (or Mr.) Four, naturally "M4" for short. She (or he) arrived last night and is significantly smaller than the other three poults (who are growing like weeds). M4 had a terrible time emerging from the egg shell, but we kept whistling a little turkey song and were just amazed to hear chirping from inside the egg for hours, we'd whistle and the egg would rock and chirp, it was sort of eerie. After about six hours Gordon couldn't stand hearing little M4 crying and struggling so hard to get out so he broke most of the shell away (breaking all of the turkey rearing rules by doing so, too), but here the little turkey poult is at last! Doing very well, although still a little unsteady and predictably stumbling around between frequent naps.